Always be in the know, get the Hay Shire Notifications app today. Snap Send Solve is the free app that allows you to easily report feedback. WaterNSW are continuing an AMBER alert status for Blue Green Algae at Leonard Street, and Maude Weir buiy, there is a GREEN notice for the Hay Weir buoy. See here for the full alert notice. 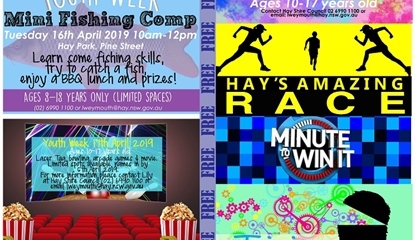 Hay has a busy Youth Week from a Mini Fishing Comp, Amazing Race, Minute to Win It, and a Day at the Movies with laser tag and bowling. As of 1st April 2019, Hay has a Hire Car (taxi-like) service again!